Centre Stage Theatre Productions Inc. is proud to present ‘Mamma Mia!’ the musical this fall. The show will run November 9th (8pm), 10th (2pm and 8pm), and 11th (2pm). Tickets are $15 for students and seniors and $20 for adults. 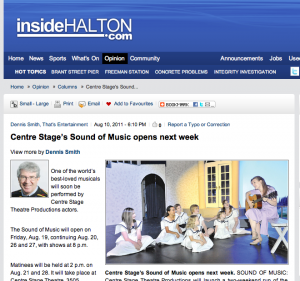 All performances will be held at Centre Stage Theatre School, 3505 Mainway in Burlington, Ontario. 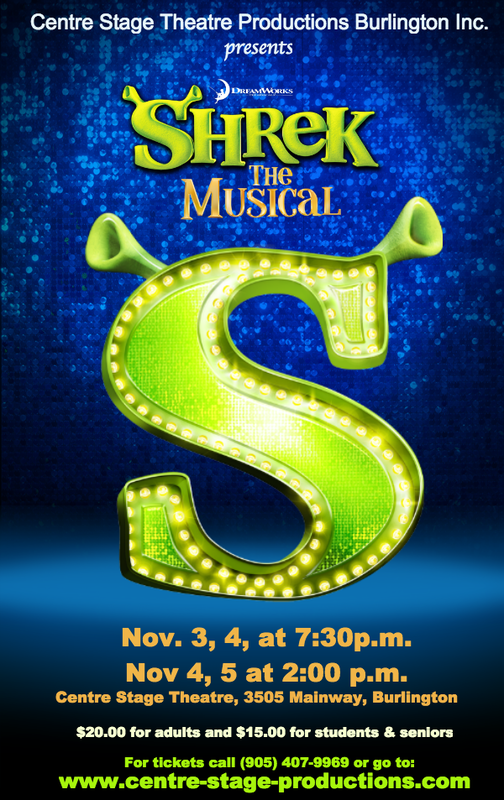 Come and help us celebrate Centre Stage Theatre Productions’ 24 th season at our performance of the Broadway smash hit, SHREK the MUSICAL, running Nov. 3, 4, at 7:30 p.m. and Nov 4, 5 at 2:00 p.m. at Centre Stage Theatre, 3505 Mainway, Burlington. Adapted from the Academy Award-winning animated DreamWorks film, this irresistible tale follows the hilarious journey of an unlikely hero. When a ragtag crew of fairy tale creatures arrives at his swamp having been cast out of the Kingdom of Duloc, Shrek finds himself pushed into a rollicking, life-changing adventure. What starts as a quest to reclaim his land and be left alone soon transforms into a journey of friendship and self-discovery, as he is joined on his travels by a wisecracking donkey and a spirited Princess who doesn’t quite fit the typical fairy tale pattern. As they navigate the machinations of the diminutive Lord Farquaad and the dangers posed by an amorous, fire-breathing dragon, this unusual trio—alongside all your favourite fairy tale characters—come to discover the true meaning of friendship and learn the lesson that beautiful ain’t always pretty. Centre Stage Theatre Productions presents this new musical revue featuring popular songs and scenes from the last 100 years. August 22, 23, and 24 at 8:00 p.m. and August 24 and 25 at 2:00 p.m. at Centre Stage Theatre School and Productions, 3505 Mainway, Burlington. Directed by Helen Zdriluk. Centre Stage Theatre Productions presents the classic Broadway musical that explores the world of a Berlin cabaret club during the rise of the Nazi party. May 3 and 4 at 8:00 p.m. and May 4 and 5 at 2:00 p.m. at Centre Stage Theatre School and Productions, 3505 Mainway, Burlington. Directed by Helen Zdriluk. Click here for tickets, call 905-407-9969. Special Group Rates Aug. 19, 20, 26, 27 8:00 p.m.
Matinee Performances Aug. 21st, Aug.28th 2:00 p.m.
LITTLE SHOP OF HORRORS – Centre Stage Theatre Productions presents the popular, light-hearted Broadway musical that tells the story of Seymour Krelborn, who sells his soul to a new species of flytrap in return for a guarantee that the plant will make him rich and famous. May 27, 28, June 2, 3, and 4 at 8:00 p.m. and May 28 at 2:00 p.m. at Centre Stage Theatre School and Productions, 3505 Mainway, Burlington. 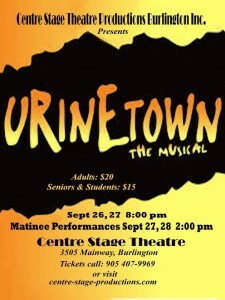 For tickets, call 905-634-7324, or visit www.centre-stage-productions.com. 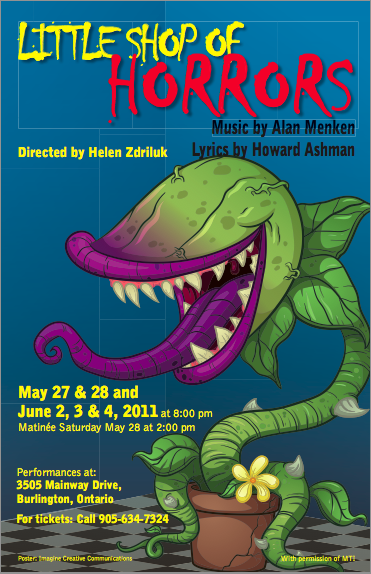 Helen Zdriluk of Centre Stage Productions invites you to watch, "Little Shop of Horrors"
Sound of Music Festival and Centre Stage Productions presents Seussical, a musical for the whole family. Bring your kids, grandkids, neighbours and friends and join us on Sunday, March 27 at 2:00 pm for Seussical. All proceeds to "Taking it to the Streets", our FREE music education program for children. Click here for information and tickets. 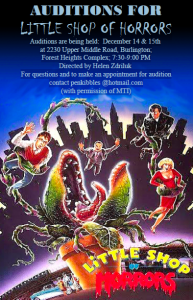 Little Shop of Horrors Auditions! 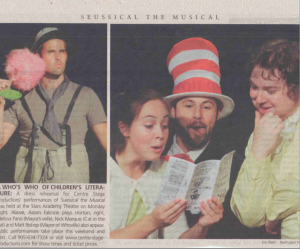 Burlington Post review of Seussical! 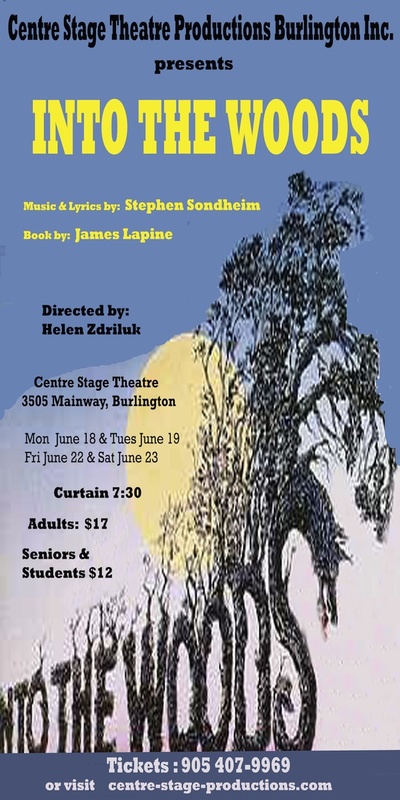 Seussical, with music by Stephen Flaherty and lyrics by Lynn Ahrens, is the current offering by Centre Stage Productions. The musical is, of course, based on the works of children’s author Theodore Geisel, better known as Dr. Seuss. The story borrows elements and characters from several of his books. It centres around Horton the Elephant (Adam Falcone) and his quest to protect the people of Who-ville who live on a speck of dust. The story line is held together by a narrator in the form of The Cat in the Hat (Nick Marquis) who often works with his young friend JoJo (Kailin Brown). Among the many other characters who live in the Jungle of Nool and who cannot believe that Horton can actually hear a Who are Gertrude McFuzz (Beth Marquis), Mayzie LaBird (Sara Jeffries), Sour Kangaroo (Jenn Zdriluk) and General Gengus Khan Schmitz (Peter Hoffman). From Who-ville we meet the Mayor (Matt Bishop) and his wife (Melisa Parisi) and there are another dozen or so performers who sing, dance and obviously have a great time in this sung-through musical that has the occasional piece of rhyming dialogue to help things along. Costumes, set pieces and stage props are all highly colourful and indeed, colourful is certainly a good way to describe this Centre Stage version of the Seuss musical. Of course, you need more than just colour to make a show like this work and, happily, this version has it in spades. Director Helen Zdriluk has not only brought together a lively, enthusiastic cast, she moves her people around the Stars Academy stage extremely well. The result is a kid-friendly show (for kids of all ages) that is certainly one of the most enjoyable Centre Stage productions I can recall seeing. If you have a chance (and perhaps a young child or two) you should consider getting yourself to the Stars Academy Theatre on Blair Road, off Mainway, where Seussical will continue its happy way on Sept. 3 and 4 at 7:30 p.m.
For tickets at $17 for adults and $12 for seniors and students, call 905-634-7324 or visit www.centre-stage-productions.com. 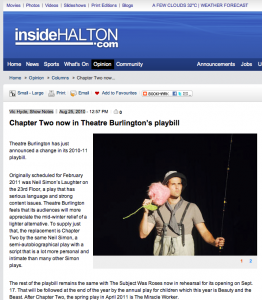 Vic Hyde posts show info and photos of the show in this past weeks Burlington Post, click here to see the article and pics of the show!